Part of my fundraising efforts for Rod's Racing have been selling cupcakes at work. With the start of my IIN nutrition course, I felt inspired to tweak Nigella Lawson's recipe a bit to make it a little healthier. Below is Carrot Cupcakes with Cream Cheese Frosting from How to be a Domestic Goddess. 2. Beat sugar, oil, and applesauce together. 4. 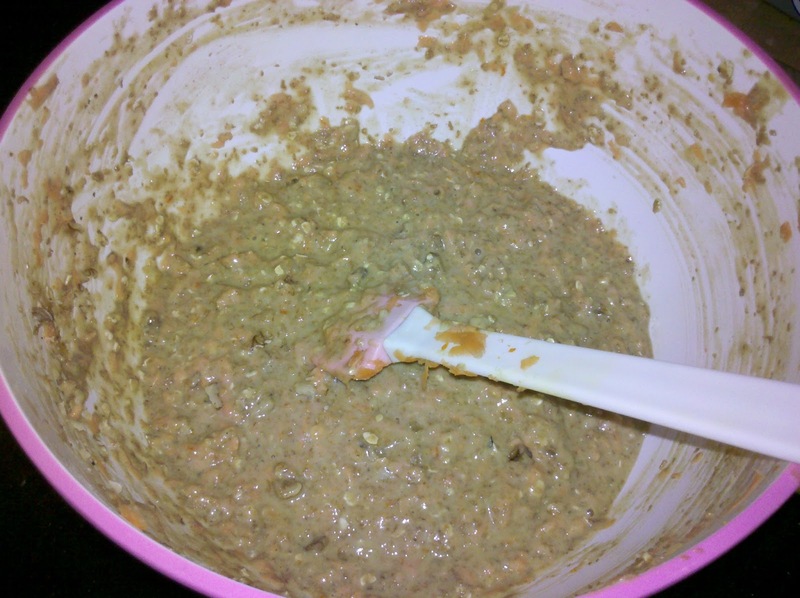 Add flour, oats, bran, baking soda, cinnamon, allspice, salt, and zests. 5. Fold in grated carrots and walnuts. 6. Spoon mixture into 12 lined muffin cups. 7. Bake for approximately 20 minutes, until a toothpick comes clean out of center. 8. While cakes cool, beat cream cheese until smooth and softened somewhat. 9. Beat in confectionery sugar. 10. Add vanilla to taste. 11. 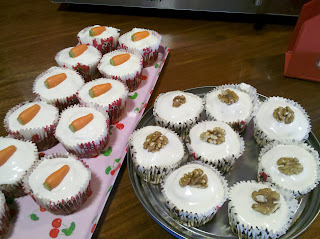 I found white chocolate 'carrots' at Sainsbury's and used them and whole walnuts to distinguish which cakes had nuts. Yumm!! Carrot cake is my favorite. I love the texture, so I love the idea of carrot cupcakes even more!